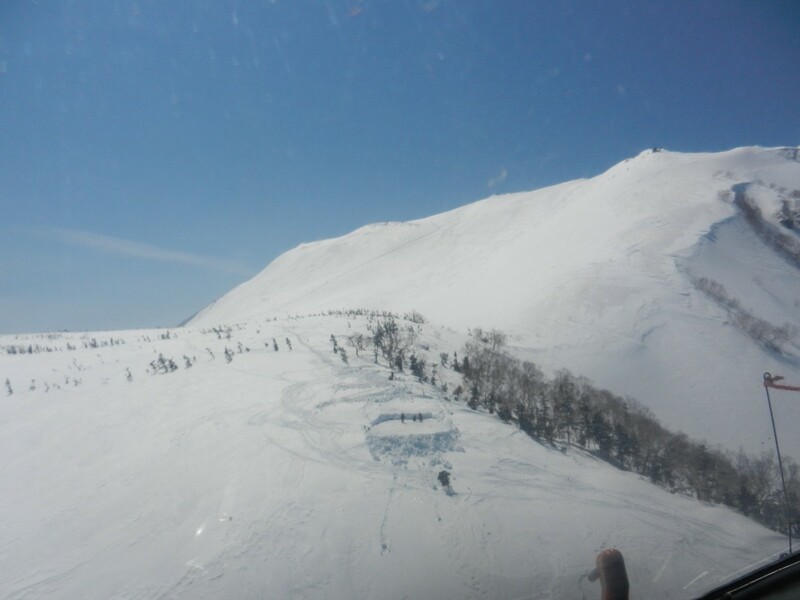 During March and April each year there is a helicopter service running at the Tsugaike Resort that will take you right up into the Hakuba backcountry. This is a great way to be introduced into what is on offer here in the Japan Alps. It can cater for intermediate skiers and snowboarders depending on the snow conditions. If there has been a lot of recent snow then I would consider it more for advanced sliders. Kids are also welcome to join in on the fun. 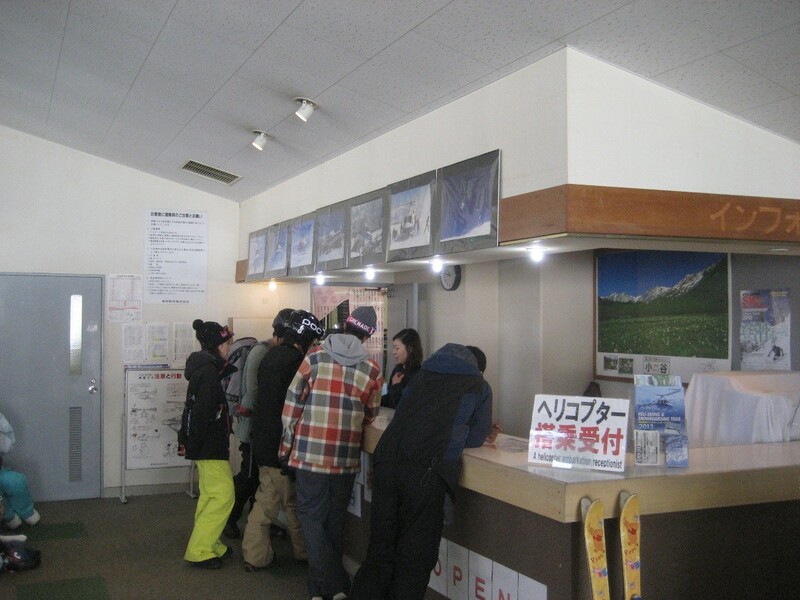 It starts off with a gondie ride up to the mid station (370 Yen). From there you register your name. Depending on the amount of people, you may be asked to wait before your name is called out and then you pay and head just outside to the heli pad. Adults are 14000 yen and children are 12500. You will be directed where to stand by the ground crew. The heli has a 9 minute turn around so you won’t be waiting long for the next one to come. Amazing views from above the resort. Get your camera out for some spectacular shots of the surrounding mountains. Norikura mountain in the background. The landing is smooth and you will be assisted out of the heli and asked to crouch down to the side before the helicopter takes off again. The ground crew will get all of your ski equipment from the storage cage. There is a ski patrol there to point you in the right direction along with flags that are easily seen for the journey down. There is a 15 minute walk to the trail mark where you can either decide to hike to the top of Norikura or take the easy way back down to the resort. I decided to take the extra time to hike up to the top (20-30 minutes). As with any trip like this please be prepared for the weather to change very suddenly. Always wear warm clothes and head back to the resort if you do see the conditions worsening. The track had been boot packed up along with a seperate skinning track which made it reasonably easy to ascend. The views along the way are breathtaking. On this day there was some low cloud on the horizon however on a clear day you can actually see the Japan Sea where the above photo is taken. The top is a plateau with a rock formation to crown your journey upon. 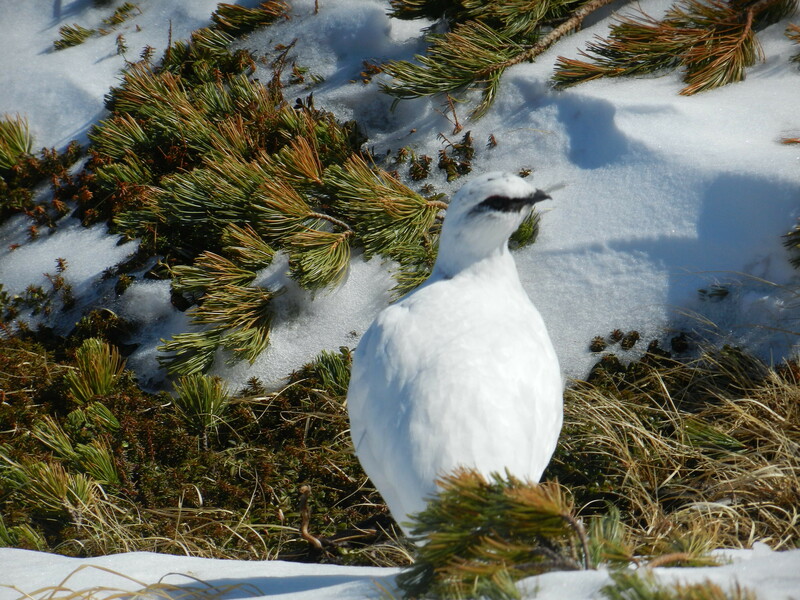 It was well worth the trip for me just to spot the rare Raicho bird (rock ptarmigan). 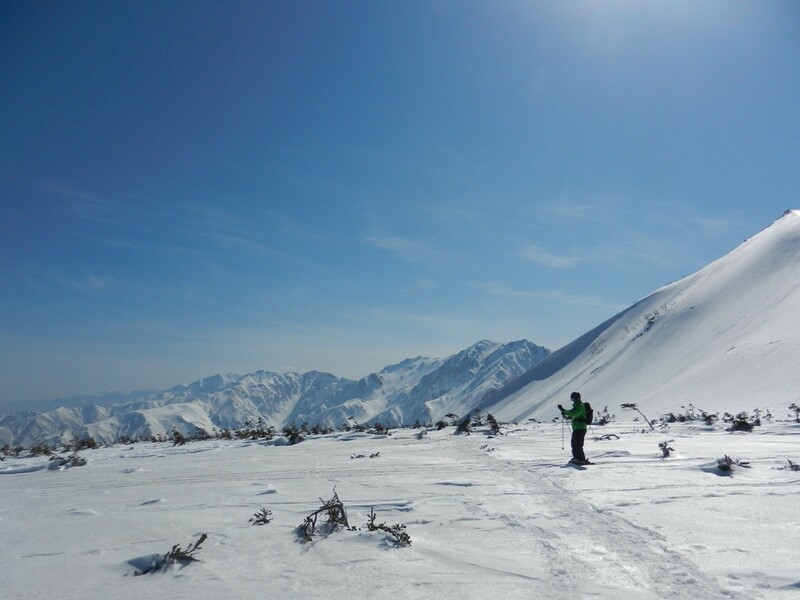 I spent half an hour admiring the area at the top and take in some of the most spectacular views of the surrounding mountains and the Hakuba Valley. I brought up a lunch pack along with a warm drink in my flask and I could sit and relax and reflect on the season past. It’s not quite over yet as far as the snow goes however the hard part is done and it’s time to really enjoy the spring skiing. It should be noted that the top section which I just climbed can be unstable and great care should be taken when dropping in. It should be considered as proper backcountry terrain. With some nice fresh tracks to be laid for a few hundred meters I am taken back down to the flat fields which I am able to traverse along before I reach the start of the flagged area again. It is from here that those who chose not to pursue the climb can make their way back down to the resort. There are some nice turns to be had here with some open trees, little gullies and mellow pitch for everyone to enjoy. It is a long run and although I did not set my stopwatch it is probably a half hour trip from top to bottom. 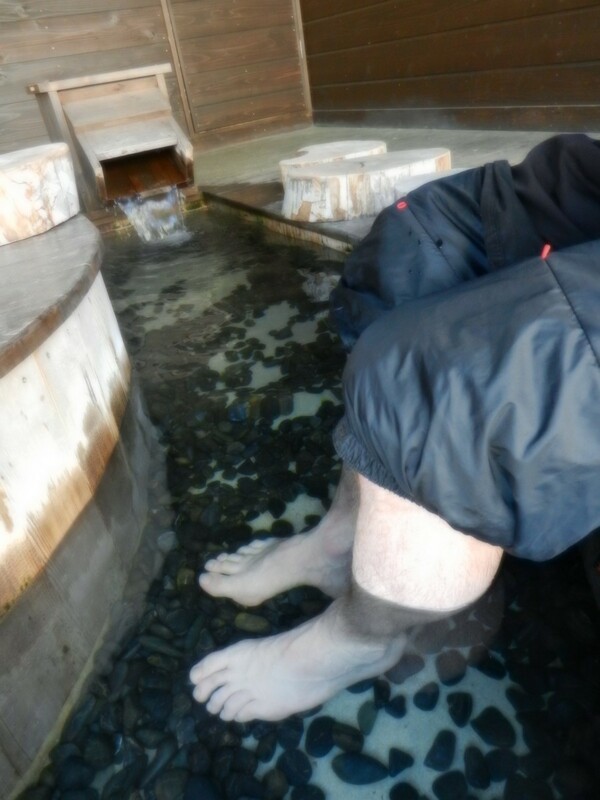 The foot onsen is located in the perfect spot just near the gondola base station and was well received on this day. 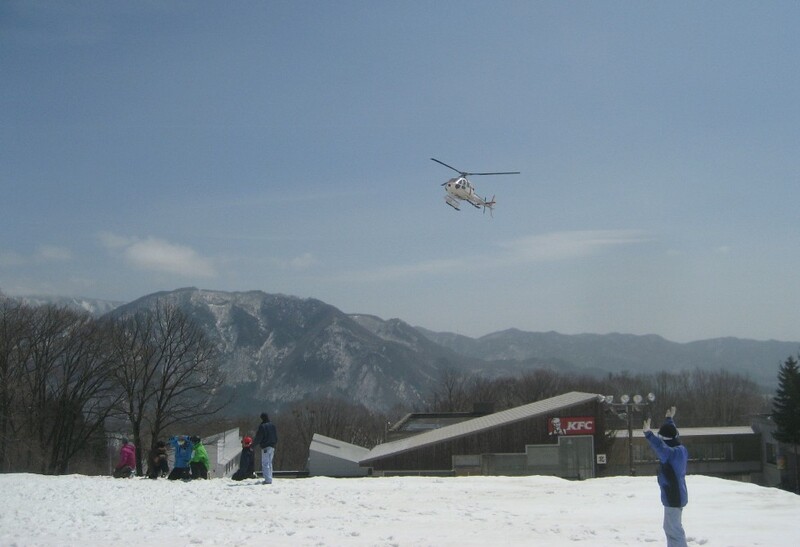 The heli skiing at Tsugaike should not be seen in the traditional sense of the term where helicopters are used to drop off and pick up in the backcountry such as in Alaska, Canada or New Zealand. 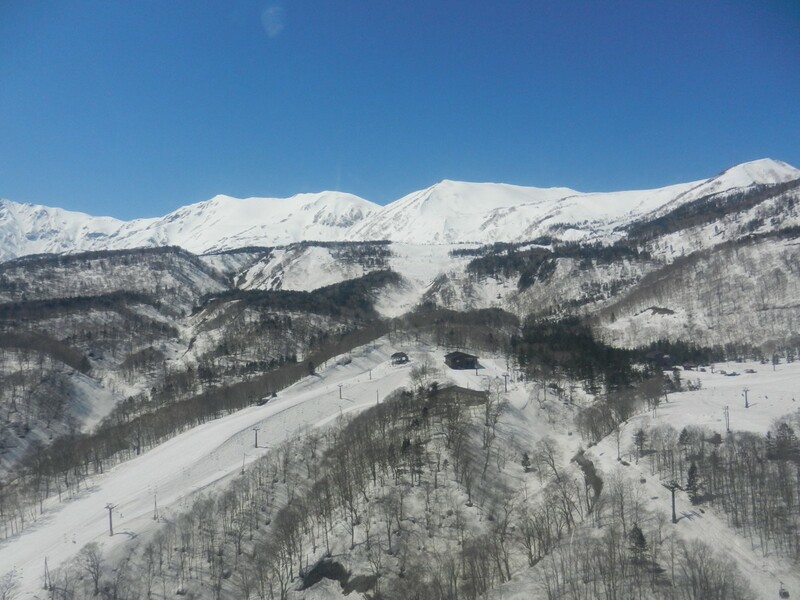 It is basically a sightseeing trip in a helicopter and then you are dropped off into a beautiful area of the Hakuba Valley and get to ski and snowboard back into the resort. It is a great way to spend a sunny day here in spring. 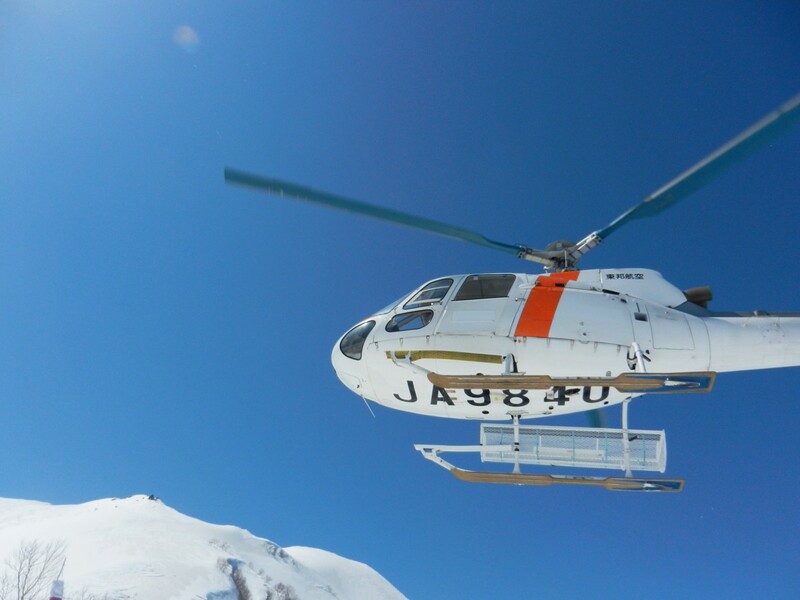 The last couple of years we have had a small heli operation running to some extent around Cortina and they are trying to develop this business into a full on heliski tour that will open up some world class terrain. Here’s hoping that can come to fruition in the next couple of years. 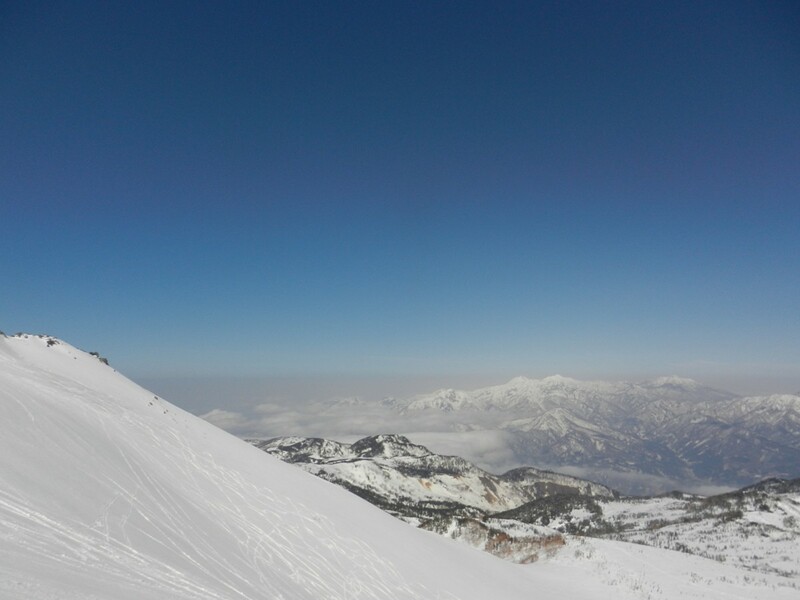 This entry was posted in Backcountry, Hakuba, Japan, ski and snowboard, snow and tagged heli ski in hakuba, Helicopters in Japan, Heliski, heliski in japan, japan alps. Bookmark the permalink.